A Kyle Gendron shot from the arc with 8:15 left in regulation, followed by four Latrell Glass baskets for Wilmot Union High School, sunk visiting Racine Lutheran 77-69 on Dec. 1. The Panthers had a 43-36 edge entering halftime, but saw the lead diminish to a 55-55 deadlock courtesy of a Crusaders’ 19-12 run to start the second half. But, after Racine Lutheran took a 57-55 lead when Crusaders’ guard Ryan Hoover made a bucket, Gendron responded with a perimeter shot in the right corner to pull the Panthers ahead 58-57. Gendron, a 6-foot-1 junior guard, finished with 15 points, including 12 in the first half, all from the arc. According to Panthers coach Jake Erbentraut, Gendron’s clutch shot exceeded his expectations, but noted the junior is capable of coming through after his offseason workouts. 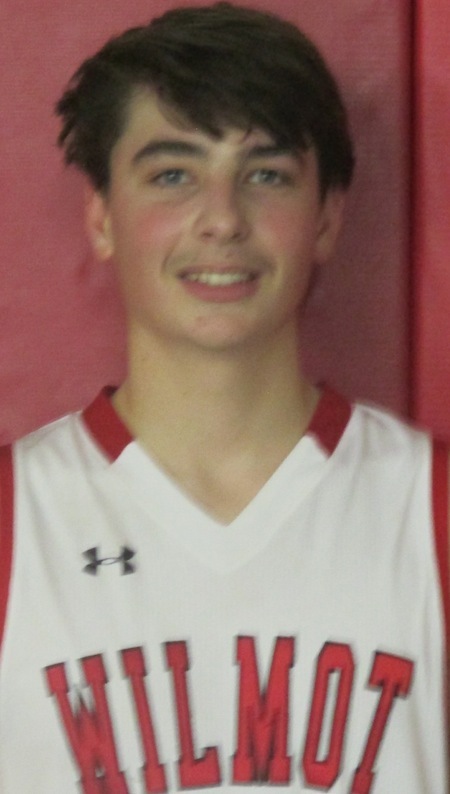 While Gendron made the decisive shot, Glass, a 5-11 junior, widened the lead in the final minutes of the contest, scoring 12 of his team-leading 20 points. Of Glass’ 12 points, two were from the perimeter, which the Panthers needed after battling Crusaders’ 6-8 senior Willie Tyler in the first half. Tyler, who scored a game-high 23 points, pounded the inside, but the Panthers drew three fouls off the Racine Lutheran forward. The strategy included double- and triple-teaming the forward, which Erbentraut believed the Panthers neutralized through a faster paced defense and offense. “I thought we did a decent job in regards to (double and triple teaming). I also thought the pace of the game was in our favor by playing faster and that worked to our advantage,” he said. In addition to Glass and Gendron, 6-2 junior guard Jeremy Bruton and senior 6-3 forward Josh Schattner each had 12 points. Wilmot improved to 1-1 in non conference contests, and has not started the Southern Lakes Conference slate, while the Crusaders dropped to 1-1.